Henry Beston. “Herbs and the Earth”. The sun sits in the middle of heaven. It has three planets above it known as the superior planets. These are mars, jupiter and saturn. It also has three planets below it known as the inferior planets. These are venus, mercury and the moon. The sun is the source of power and heat in heaven and everybody knows that heat rises. Ancient philosophers reached the logical conclusion that mars must absorb much of this heat for its sphere lay immediately above that of the sun. Saturn being the furthest away planet from the sun would be the coldest. Jupiter sat between mars and saturn. Knowing that heat doesn’t sink downwards they reckoned that the three planets below the sun would be colder than the three above. But as venus is closer to the sun’s sphere it would be slightly warmer than the moon which was the furthest away. Mercury sat between venus and the moon. 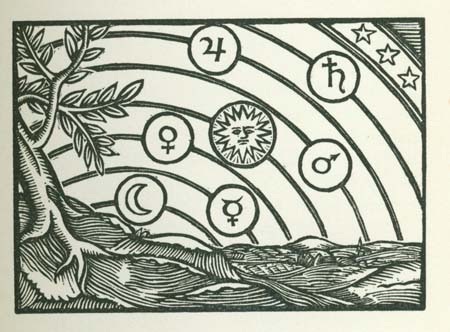 Ancient astrologers believed that each planet had its own intrinsic humoral quality. They looked at how they appeared in the sky and this helped them to gauge how they would affect life on earth. They knew that increased moisture and warmth made fruits ripen and swell, becoming plump, juicy and full of goodness. This fruitful analogy was applied to the planets. Planets that glistened and gleamed were assumed to have more moisture that the ones that didn’t. The most obvious example of this is the moon which swells up like a ripening fruit promising great bounty. But although nowhere near the moon’s size both venus and jupiter also glisten and gleam and were considered moist and bountiful too. In the very distant past mercury was actually known as ‘the Glistener’. But if these planets glistened where did the moisture and warmth come from? Obviously the source of heat came from the sun. In the past it was believed that the earth gave off moist vapours which rose upwards into the atmosphere to be absorbed by the planets. The philosophy of planetary humors soon developed based upon each planet’s position with regard to the sun’s heat and these rising moist vapours. The sun invigorates life and vitality with its golden rays of light. The sun has two obvious cycles by which we live our lives, the cycle of day and night and the cycle of the seasons. The sun is the cause of earthly activity and it’s qualities are obvious. It is primarily hot which leads to dryness. This is exactly what happens when the sun evaporates the morning dew or summer comes around. So the sun’s intrinsic humoral nature is hot and dry. It is at sunrise that earthly activity commences, ceasing at sundown when night falls. Daytime then is of the same humoral nature as the sun, hot and dry. The cycle of the seasons reflect this same sequence. Spring and summer are the warmer, dryer and dynamic seasons of the year for it is at spring life awakens following winter. Autumn and winter are the cold, wet and inactive seasons when life goes to sleep. Because the sun instigates earthly activity it is regarded as active and dynamic in nature, qualities associated with men. The sun is regarded as masculine in traditional astrology. Far below the heat for the sun is the moon with no intrinsic heat of its own. It is considered as primarily cold. But being closest to earth its absorbs much of the rising vapours and is therefore moist. So the moon’s intrinsic humoral nature is cold and moist. But the story doesn’t end here. As it waxes it absorbs and reflects more of the sun’s light and more importantly its heat. So the moon becomes warmer and is normally regarded as humidifying, warm and moist. These qualities encourage fertility and growth. Night-time is when earthly activity ceases and night has the same humoral nature as the moon, it is cold and moist. It is during the night that we rest and rest is restorative. It nurtures our vitality and strength necessary for the forthcoming day. These are passive, feminine qualities associated with women. The moon is regarded as feminine in traditional astrology. Saturn’s appearance in the sky is pale ash-grey, dull in colour. It moves very slowly through the night sky. It certainly doesn’t glisten. This gave the ancients clues to its humoral nature. Being furthest away from the sun’s heat it is primarily cold and it also receives precious little of the moist earthly vapours. Saturn’s intrinsic humoral nature then is cold and dry. These are not qualities conducive to growth or life. Although plants can grow in these conditions they do so in a slow, restricted way if they do manage to grow in the first place. Combined with saturn’s slow and deliberate heavenly motion it means that anything promised by saturn is never rushed – saturn’s effects are gradual and take time. This ensures stability and reliability. Because of saturn’s active effect of hindering life and growth it was regarded as masculine. It was known as the greater malefic. Jupiter is sandwiched between saturn’s extreme cold and the scorching heat of mars. Here in this middle zone a happy medium exists. Jupiter glistens in the sky which we know indicates moisture and a fertile nature. Jupiter’s intrinsic humoral nature is regarded as temperate, warm and moist. Jupiter moves through the sky in a regular manner of approximately one zodiac sign per year. This stable motion in the sky when combined with a fertile nature was seen as a great boon. It helped life to thrive and produce consistent bounty. Because of jupiter’s active effect of promoting life and growth it was regarded as masculine. It was known as the greater benefic. Mars is hot and dry for it lies immediately above the rising heat from the sun. Unsurprisingly mars’ intrinsic humoral nature is hot and dry. But this is not the warming and invigorating golden heat of the sun. It is a burning heat. Mars warns us of this by glowing red in the night sky like an ember. This extreme heat is not conducive to life. Although plants can grow in torrid conditions, following a quick spurt of growth they tend to dehydrate, burn out and die off. In the sky mars slows down and changes direction quickly when compared with the other superior planets. This gave mars its association with sudden changes, traits not usually conducive to growth and development. Combined with its active adverse effects on life and growth, mars it was regarded as masculine. It was known as the lesser malefic. Venus is like the moon with no intrinsic heat of its own so is regarded as primarily cold. Venus does get some heat from the sun in the same way the moon does. Being closer to the earth it absorbs more moisture. Venus then has an intrinsic humoral nature of cold and moist. This is obvious by the magnitude of its light for venus glistens very brightly in the sky and is beautiful to behold. It is the third brightest object in the sky second only to the lights and venus denotes much fertility. Venus passively receives its moisture and heat. Both are conducive to life and growth. These are feminine qualities associated with women and so venus is regarded as feminine in nature. It was known as the lesser benefic. Mercury is sometimes hot and dry at other times cold and moist. The hot and dry nature of mercury is due to his close proximity to the sun. Mercury’s cold and moist nature is due to his proximity to the moon upon who’s sphere he borders. Mercury is not considered as masculine or feminine but mixed in nature. We would expect anything promised by mercury to be fleeting for its humoral nature changes quickly. Mercury is also the fastest moving planet in the sky and often changes direction going backwards then forwards again and again. Being closest to the sun mercury is hard to see in the first place. Because of the aforementioned facts mercury’s variable nature meant that it was regarded as unstable. These are qualities not necessarily conducive to life and growth. As a result mercury was seen as slightly malefic in nature.